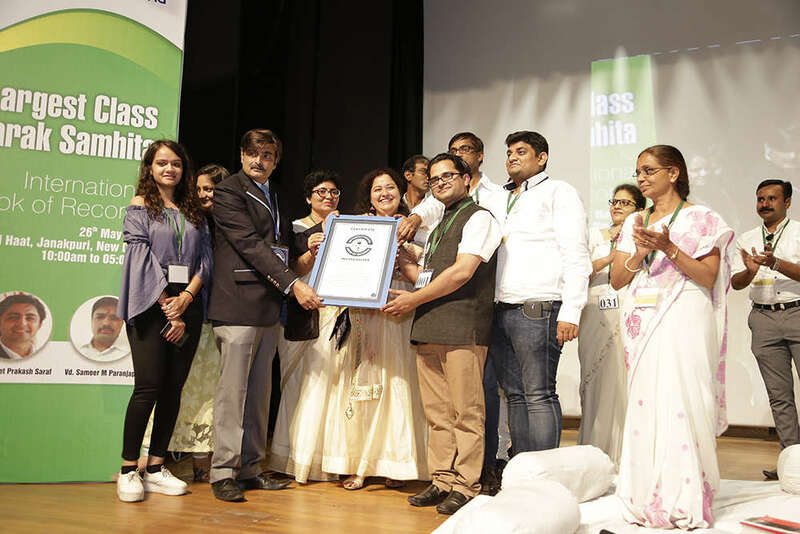 The evening of May 26, 2018, witnessed a historic event in New Delhi when the National Ayurveda Students and Youth Association’s (NASYA) ‘largest class of Charak Samhita’ made its entry into the International Book of Records. The occasion, attended by AYUSH dignitaries, had as many as 703 ayurveda practitioners and students as well as many eminent dignitaries and doctors participating in it. Aimed at reviving the interest of ayurveda students in reading the original classical texts and to showcase the importance of these shastras for a complete understanding of the ancient health science, the ‘largest class of Charak Samhita’ was organised by NASYA with the support of the Ministry of AYUSH and Vijnana Bharati. Charak Samhita is the most important of the classical texts from which a major part of ayurveda has originated. A gentle hands-on treatment, Craniosacral Therapy (CST) is used to balance the craniosacral rhythm and release the tensions in the body, thereby relieving pain and facilitating complete body healing. The craniosacral system consists of seven cranial bones, the spinal cord, vertebrae, sacrum, coccyx, dura mater, and cerebrospinal fluid. Any impediment to these structures leads to restriction of the craniosacral system, thereby causing various dysfunctions in the body. The pulsating of the craniosacral system at a rhythm of six to 12 cycles per minute forms the basis of this treatment. If the rhythm is of a very weak amplitude then it may mean low vitality, whereas if the rhythm is restricted on one side it might indicate some restriction on that particular side of the body. A therapist restores the rhythm with a very gentle touch. Intrigue and eagerness to know more about the therapy led me to read the book Your Inner Physician and You by Dr John Upledger, which had amazing testimonials of some very complex cases resolved by CST. One of the testimonials was of a young boy—he needed crutches to walk and had to be fed through a Ryle’s tube—who responded excellently to a few sessions of CST. He could walk without crutches and also eat normally from the mouth after his treatment. The book highlights the significance of cell memory. The records of difficult emotions and experiences are kept by the body in its tissues and cells. Encasement in a tissue or organ walled-off from the rest of the body leads to the formation of an energy cyst. Holding this disruptive energy in oblivion from the rest of the body ensures normal functioning of the body without disturbances. Determined to learn further, I finally learnt Dr John Upledger’s craniosacral balancing in a span of two years. I found for myself that all the muscular pains, aches, and disorders which had resisted every mode of treatment, started improving, and I was overjoyed to see the dramatic results a few sessions of CST had brought. I treated a three-month-old baby for the first time with CST, and in three sessions the baby not only relaxed but had a full recovery from colic pain. A lady with a history of constant low back pain, relived the memory of having delivered a stillborn baby and spontaneously also recalled a past life wherein she had died in childbirth. As the pent-up grief and sorrow got released, she also resolved her backache. This incident cemented my trust in the concept that traumatic memories are stored in tissues and can be released. My shift in perception caused a greater shift in my patients’ reality. More of my patients started releasing their emotional burdens in CST sessions. Craniosacral balancing is useful in treating headaches, migraines, lower back pain, asthma, anxiety, stress disorders, psychosomatic disorders, tinnitus, and autoimmune disorders. Meditation and concentration are the royal roads to perfection. Concentration leads to meditation and enables man to be steadfast in his material pursuit. Whereas, meditation leads to the attainment of salvation or moksha. Meditation annihilates the three kinds of taapas (fevers) and five kleshaas (sorrows). It is an aeroplane that helps the aspirant to soar high in the realms of eternal bliss and everlasting peace. It is a mysterious ladder that connects earth and heaven and takes the aspirant to the immortal abode of Brahman. Practise meditation early in the morning from four to six in the Brahma muhurta— the optimum time to meditate. Sit in padma, siddha, or sukha asana. Keep your head, neck, and spine straight and concentrate either on trikuti (the space between the eyebrows) or on your heart, with eyes closed. Meditate on Om. This is known as nirguna dhyana. (meditating on formlessness). If you meditate for one or two hours in the Brahma muhurta, you will work peacefully throughout the day without any mental disturbance. Meditation develops strong and pure thoughts, brings greater clarity to your visualisation, and helps lower stress levels. Meditation is maintaining the flow of God consciousness. All worldly thoughts are shut out from the mind as it is saturated with the presence of the Divine. It is the only way to attain immortality and eternal bliss. Great rishis and sages of yore like Yajnavalkya and Uddalaka acquired the knowledge of the Self, which is a means to secure the highest communion through intense meditation. Regular meditation opens the avenues of increasing one’s intuition, calming and steadying the mind, and feeling ecstasy. Without the help of meditation, you cannot attain knowledge of the Self and attain your Highest Self. The mind has to be trained regularly to shift it from the gross plane to a subtle or sukshma plane. At our Reiki centre, we teach how to meditate and how to concentrate. We welcome all to join free meditation at our Reiki centre. We also conduct Reiki and meditative spiritual journey workshops which include cosmic meditation, dynamic meditation, Shiva and Buddha sutras, nature walk, camping, nutritional diet, etc. These workshops are organised in Rishikesh, Dehradun, Mussoorie, Haridwar, Dharamshala, Shimla, and Nainital, as well as in countries like Japan, Bali, Thailand, and Malaysia.